The latest Kit order will be available by this weekend for the first Club Championship Galas. Collection can be made from Friday night at Evington Leisure Centre during our training sessions. Please see our Swim Shop Coordinator for further information. 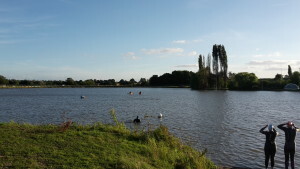 The weather forecast is good so open water training will be on Saturday morning this week. The temperature last night was 19C and although it looks like it might be rainy the water will be warm enough to comfortably swim without a wetsuit. Training will again take place at Mallory Park Race Circuit, Kirkby Mallory, LE9 7QE where lake swimming is run by Cycling Mallory Park. Map and safety information here: The cost to is £5, payable at the time to Cycling Mallory. They have a small number of wetsuits to hire if you contact them directly for anyone who can’t face swimming without! Swimwear (already on to save time! ), goggles and a bright coloured hat (I have spares if you only have a silver one). Tony, (Monday and Friday coach), has set himself a personal challenge for the rest of the year and I hoping that you can support him with your good wishes for even sponsor him. Tony is a stalwart volunteer of Leicester Neptune SC, having first got involved by swimming for the club as a child and well into adulthood. These days, he would turn out for a gala in a heartbeat but spends most of his time coaching, either for Leicester Neptune SC, or for his other clubs. In working towards this challenge, he is aiming to raise money for multiple charities and give his own personal fitness a boost. His provisional target is to swim 22 miles over 12 consecutive weeks between September and December and raise a minimum of £800 in doing so. This is the equivalent to 1408 lengths of a 25m pool. He has thought carefully about the charities he would like to support and will be splitting the money equally among the following charities: Apire, Diabetes UK, British Heart Foundation (who have helped him in the past), Air Ambulance Service, Mouth & Foot Painters (because this was a special charity that his mother supported), and Hedgehog Rescue. I hope you fee able to support Tony with this mission, whether this is by offering to sponsor him as I have, joining in with his challenge, or just giving him encouragement when you see him ploughing up and down the pool in the time before our training sessions.